I am pleased to announce that I’ve received word through forum networks such as Skyscraperpage and CPTDB that new buses coming to Surrey Transit Centre will be 60-foot hybrid articulated buses for the 96 B-Line. This newest bus order is being assigned to both Surrey and Burnaby Transit Centres to replace old articulated buses due for retirement, and the first buses will be arriving later this month. They will be similar to the 12000-series Xcelsior XDE60s (pictured above) currently being used on routes in Richmond and Vancouver. The new buses will feature a hybrid diesel-electric transmission to improve energy-efficiency and solve the ride jerky-ness of plain diesel buses, offering smoother and higher quality rides. LED lighting will be used along with a better-optimized seating layout. Finally, these buses will be air-conditioned, giving Surrey riders a more comfortable experience in warmer summer months. Surrey’s 96 B-Line, linking Newton Exchange with Guildford Town Centre through Surrey Central, was originally made possible with a transfer of 11 of the region’s oldest articulated buses (S8001-8011) to Surrey Transit Centre in late 2013. These buses were the first “B-Line” buses brought to the region to service the #99 B-Line back in 1998. Due to their age, the old buses aren’t always available; standard-size buses are often used as a substitute when one of the articulated buses is in for repairs or maintenance. The upcoming XDE60’s will let the old buses be retired, while giving the city 12 of the fleet’s newest articulated buses (one additional bus!). This will ensure that every bus running on the 96 is articulated. [OPEN TO ENLARGE] Concept of rapid bus service instead of LRT on King George Blvd/104 Ave. I look forward to the arrivals of S15001-S15012. As a regular 96 B-Line user I’m excited for the new transit experience that these new buses will bring for Surrey transit riders. I’m also excited for the potential they have in demonstrating BRT (bus rapid transit) as an option for improving transit the city. As some of you know, I have been a strong proponent of a BRT network and SkyTrain expansion over the currently proposed Light Rail Transit network in Surrey. A Bus Rapid Transit network would reduce transfers by enabling buses to through-run onto corridors like 72nd Ave or continuously down King George Blvd. to White Rock Centre. Riders on the corridor could then use buses for longer-distance commutes with less transferring. This would also cut down on the amount of transfer line-ups that crowd buses and space at transit centres such as Newton Exchange. It would be less disruptive to build BRT infrastructure compared to LRT infrastructure, with the potential to build gradually and avoid the service disruptions riders would face with edge-to-edge street construction required for an LRT system. A BRT system would also cost less to operate; City officials have still not demonstrated what the plan is to pay for $22 million in annual deficits for operations of the city’s LRT network. This is an actual photo of LRT construction work in Kitchener-Waterloo, Ontario, and shows the reality that Surrey commuters will have to face if the City moves ahead with an LRT. Notice how the author attempts to justify the Light Rail technology aspect in this way, by suggesting that the “permanent” presence of rail-based transit (i.e. visible rails on the street) has a positive implication on image from riders and developers, that isn’t achieved with Bus Rapid Transit (BRT). This notion that BRT can have no “permanence” and doesn’t attract economic development is has been challenged by transportation professionals. Investing in enhancing bus service instead of physical rails on the street is not a failure to create “permanence”. After all, rapid transit improvements are justified in the first place because the demand for the transit on that corridor is already quite high without it. According to a new report released by the Institute for Transportation & Development Policy, BRT systems in North America are outperforming LRT in terms of how much development is generated per transit investment dollar. While the study found an LRT line in Portland had generated the most development, when this was divided per dollar of transit investment, the LRT line actually generated 31 times less development, than the system that led the per-dollar development measure: a BRT system in Cleveland. Clearly, when the outcomes are given similar marketing and promotion, developers don’t actually care if the system uses rails or not. Here in Canada, York Regional Transit in Ontario, with its “VIVANext” program to implement city-wide BRT, is helping to challenge the popular notion that only rail systems can reinvigorate communities. The video shows vibrant urban communities growing around future BRT stations. This is a very dangerous myth – and one of the reasons this is dangerous is because of the untold implication, wherein going straight to a Light Rail system results in other parts of the transit system lose transit service, as a means of coping with the associated costs. Perhaps the best example of this is the downtown streetcar system in Portland, Oregon. The reveled streetcar had vibrant beginnings in its promise to provide a clean, high-quality service every 10 minutes, promoting and connecting new developments in the downtown core. Its big-ticket issue, however, lies in the fact that it was not planned around actually improving mobility. The resulting service was not significantly more useful than existing city buses, and was often slower than walking or cycling. It was easily and frequently disrupted by accidents, poorly parked cars, and a host of other issues. Above video: Portland Streetcar gets stuck due to a poorly parked vehicle, in what would be a minor and avoidable adjustment for a bus. The costs that the streetcar saddled the city with didn’t help the major funding shortages affecting region-wide transit in the late 2000s, resulting in massive service cuts and cancellations throughout the region. It was so bad that in 2009, the regional operator was forced to abolish its entire 15-minute frequent transit network due to lack of funds. Throughout its history, the streetcar has also received service cutbacks – which arguably challenge the notion that rail has “permanence”. The streetcar has never once operated at the initially promised frequencies of 10 minutes. The cutbacks were initially to the point where you would have to wait as long for a streetcar in the supposedly-vibrant city centre, as you would for a bus in a lower-density part of Surrey. The streetcar’s ridership is so low that only 6% of the streetcar’s operating costs comes from farebox recovery. 94% of operating costs must be subsidized, and the subsidy is so heavy that it has City Auditors concerned that the streetcar is taking away from other basic services. “We remain concerned about how projects like Portland Streetcar displace other transportation services,” referring to street maintenance. What is clear about the Portland streetcar example is that the ‘rails’ in the transit lines haven’t made any meaningful difference. They have added so little value, which ends up coming out negative against the funding issues that affected transit service throughout the region. When the streetcars are unable to run due to an accident or some issue, the replacement shuttle buses are providing essentially the same service as the streetcars. It has had some people thinking whether Portland could follow examples here in Vancouver and in Seattle, launching a well-branded, electric trolley-bus service could have been more suitable for not just the streetcar routes, but other bus routes throughout the city as well. 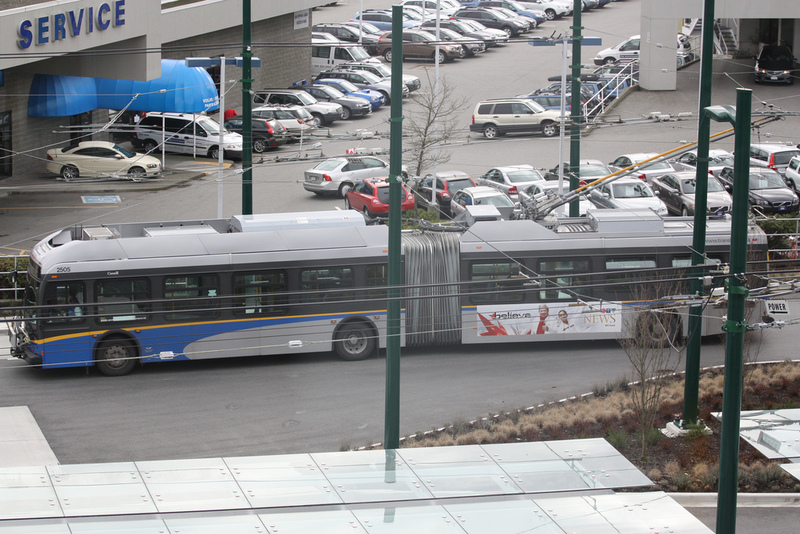 TransLink operates several articulated trolley buses here in Vancouver. Recently, consultant Jarrett Walker’s Human Transit blog (which as you’ll notice, I’ve already referenced a few times in this write-up) mentioned that when naturally low-performing local and suburban bus services are excluded from the picture, frequent bus service is nearly as cost-efficient as LRT (in terms of the cost for every rider on the end-service). Many advocates of LRT would rather have you look at the bus vs LRT operating costs per rider, as they apply to the entire transit system. This creates misleading attitudes surrounding buses, because the numbers include the local and suburban bus services that are naturally poor-performing (and on top of that, will likely never be replaced/justified by an LRT, ever). This chart says two remarkable things: Firstly, that frequent bus performance is now very close to light rail performance. Secondly, that the spread between Frequent Bus and infrequent bus is usually bigger than the spread between all buses and light rail. The numbers above demonstrate that when you give buses the service quality and frequency usually associated with a more expensive LRT investment, they can be nearly as cost-efficient to operate. Likewise, if buses are also given the same amenities that add to comfort, image and sleekness, then they will likely be appreciated as much by the public. BRT can receive the same “permanence enhancements” as LRT such as branding, way-finding information, landscaping, lighting, and dedicated rights-of-way. Many BRT systems have adopted innovative features that go a long way towards bridging the gap between BRT and LRT. “Look ma, no hands”! 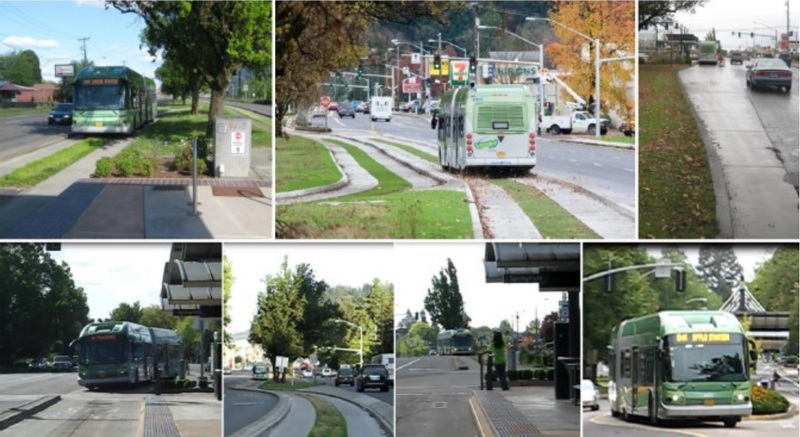 In Eugene, Oregon, the “Emerald Express” BRT system adopted a magnetically-guided automated steering system, allowing the bus to make more precise turns and dock with precision at every BRT station. The revenue service of this guided system was introduced in June 2013 and is now celebrating its 2nd anniversary. This guided BRT design allows for reduced lane-width requirements. Steering is automated through the electronic guidance, which only requires pavement under the wheel tracks. This provides an opportunity for the inclusion of additional green space between the tracks. The guided bus technique allows for “precision docking” at the stations. While the buses do need to be specially equipped, they can still run on other roads. This system does not require the extensive infrastructure and costs of previously-developed “guided” BRT systems, and can in fact save costs by allowing a tighter, narrower running right-of-way for rapid buses. Where could you go with Bus Rapid Transit? I personally think that a lot of the potential of BRT systems is dismissed not necessarily because of disapproval, but also because the discussion is never really started. You would never be able to travel from King George & 88th and end up in South Surrey or even Coquitlam without transferring, on the currently proposed LRT system. Unfortunately, that’s been pushed out as a key consideration in transit planning here. The Emerald Express is an excellent example of how current technology can be used to bridge the gap between BRT and LRT. And, on top of the examples showed in Eugene, there are so many other ways to “bridge the gaps”. At this point, basically every heavily-promoted LRT feature can be replicated with BRT (and likewise, every streetcar feature with buses). Well-designed BRT systems incorporate lements such as: sheltered stations with wait-time displays, off-board payment, seating and other amenities adding comfort and ambiance. Hybrid diesel-electric or electric trolley buses can be used to lower or eliminate carbon emissions – and provide the smoother, non-jerky ride quality of electric vehicles. Plus, double-articulated buses are increasingly being used – giving a little more flexibility in terms of capacity (Light Rail’s current running advantage). If BRT can gain more traction in this decade, it will pave the way for much better transit in all our cities, because BRT costs a lot less to implement, and has numerous flexibility advantages over Light Rail systems in urban settings. You could build more BRT than an LRT with the same dollar, and extend its reach further by through-running onto other corridors. In order for this to happen, transit advocates must abandon any and all adherence to the “only rail creates development” myth. The fear-mongering, excuses and nay-saying from pro-LRT activists is becoming a serious setback to the realization of transit potential in our cities. 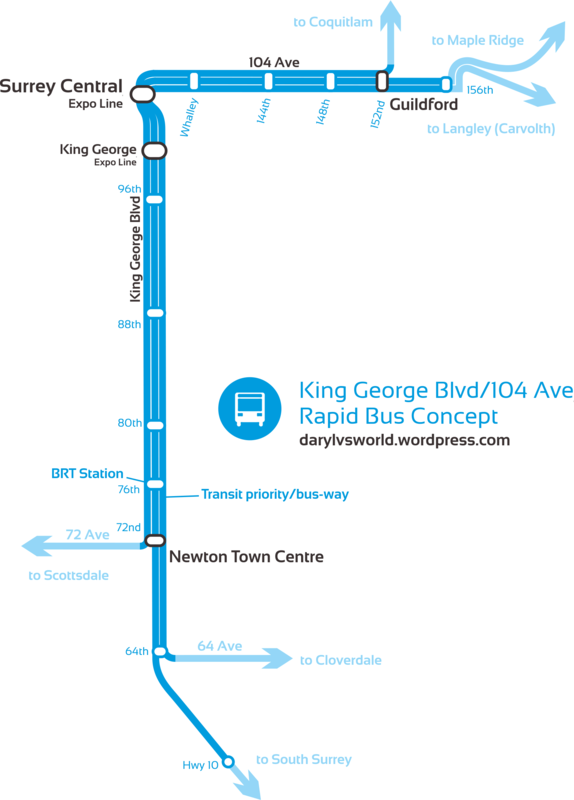 My concept of rapid bus service instead of LRT on King George Blvd/104 Ave in Surrey. Note the continuation of 3 different services to allow direct connections to Cloverdale, Coquitlam and other communities. Through-running flexibility is a major BRT advantage that won’t be had by currently-proposed LRT. I was delighted to learn that the new bus stop at the 156th Street-Highway 1 off-ramp to the 555 Port Mann Express rapid bus would open earlier than expected – in time for the 2014 back-to-school season, and saving commuters to downtown and students at post-secondary institutions like Simon Fraser University and Douglas College minutes upon minutes every day. 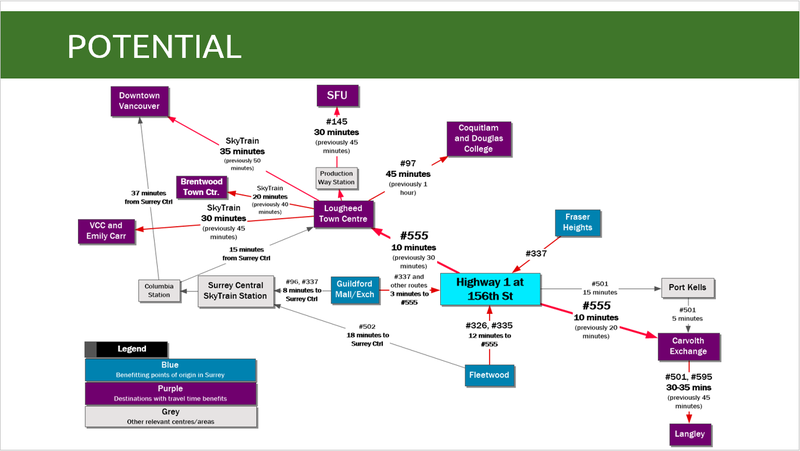 The new stop helps Surrey residents in Guildford and Fraser Heights connect to the Millenium Line SkyTrain in Coquitlam, significantly improving links to SFU, Brentwood Town Centre and Downtown Vancouver. For those who didn’t know, the bus stop for the Highway 1 Rapid Bus (#555 Port Mann Express) has been a topic of controversy for some time after a bus stop for the service was not provided in Surrey, due to several issues of mis-communication between TransLink, the Provincial Government, and the City of Surrey. A private developer who was expected to build a transit exchange may also have been involved in the fray. 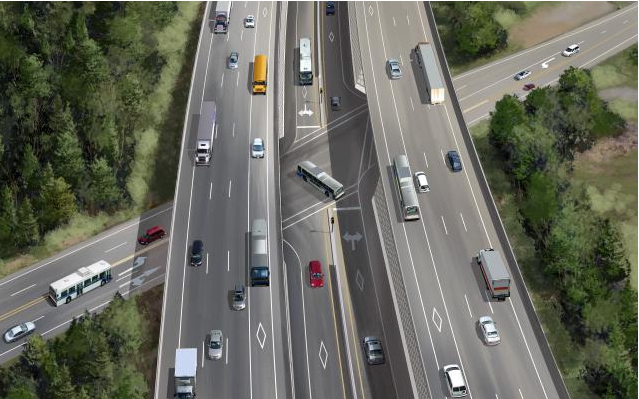 Original concept images by the provincial ministry of transportation showed buses turning and making a stop at 156th Street, giving a new rapid transit access to Surrey residents in Guildford and Fraser Heights. When the HOV ramp and bridge were opened in late 2012 – along with the introduction of the rapid bus route – this didn’t materialize, secluding Surrey residents from improved transit access in the face of a new toll on the bridge. Picture of 156th Street underpass and HOV ramps, showing buses that would have been using the interchange and stopping for passengers. Fraser Heights residents would feel the pinch of this when ridership on the bus route #337 grew at the fastest rate of any Surrey bus route – and this was before the introduction of Port Mann Bridge tolls – indicating a high level of demand for the new #555 service that was never provided. My work ensured that this got built! We have TransLink (who worked and cooperated with other parties to ensure this would be in service) and the City of Surrey (who ended up providing the bulk of the funding, according to recent Transportation & Infrastructure Committee reports) to officially give thanks to for this stop – but I’m not sure how many people will be talking about the role I and some others had in actually ensuring that this stop was built and in service yesterday! The surprise retraction of the project and the transit service put a significant amount of pressure on me as I was hoping to benefit from the new stop service, being a Guildford resident and a major transit user facing a transition from high school to university. It prompted me to launch a big advocacy effort myself, which culminated with the creation and presentation of an unofficial “business case” telling city officials why this stop would be so important – not just for me but for several others who could have been benefitting, and were now otherwise losing. In fact, the expected construction timing and inability to provide the bus stop in due time would become one of many factors behind my decision last year to pack my bags, leave Surrey, and temporarily move to the North of Fraser – making a new home for myself near a Burnaby SkyTrain Station, where I have lived for the past year. I worked with many individuals – including the vocal and active Daniel Badragan, a local-area student, who wrote quite a few letters to the editor in protest surrounding the missing stop – coming up with ways to advocate for the missing stop. It’s probably no surprise that my delight has been intensified by the coincidence of the opening date of the stop with my return to residency in the South of Fraser (I moved back to Surrey yesterday and will be here for a few days before embarking on a major study abroad tenure). The opening of the stop was suddenly added to the TransLink fall service changes page, to a fanfare of probably a few commuters and people except those I heard around me who were talking about it on the bus. View my original unofficial “business case” for this rapid bus stop, below! Read a nearby city resident’s attempt to construct a “business case” document for a missing stop on a new rapid bus line now! A permanent contribution from me to City of Surrey residents, particularly in Fraser Heights, Guildofrd and Fleetwood. This business case is for everyone; everyone can use this business case. It can be used by the City of Surrey, by TransLink, by other advocates, by anyone. It’s been sent to City of Surrey staff. It will shortly be sent to the media. It’s my bigshot attempt to get some action done on this. Enter your email address to subscribe to this blog and stay up to date with my thoughts! You will receive notifications of new posts by email.